The Trend is Your Friend, Follow it and you’ll be fine.Surely you’re familiar with this expression – ‘The trend is your friend’. The actual source of who said that is unknown but the statement remains to be the Holy Grail of the most successful traders. The biggest profits in Forex can be made by following the bigger trends. 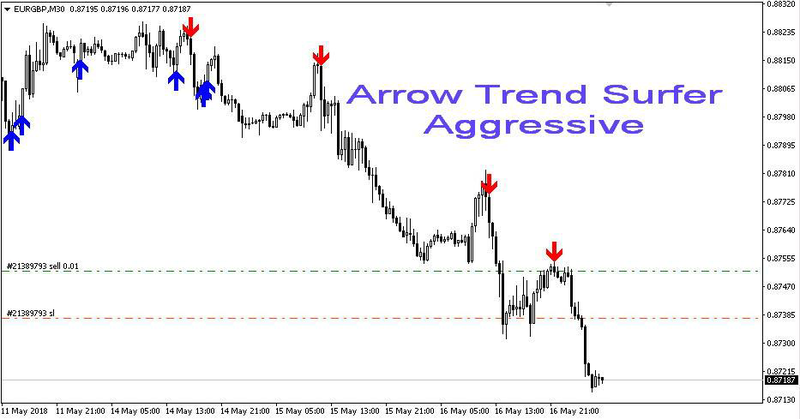 Arrow Trend Surfer, a non-repainting trend indicator is specifically designed to help you recognize and follow trends based on its signals in the chart. We added a few additional features that will be helpful to any trader using MT4 / MT5 charts. How this important for you? 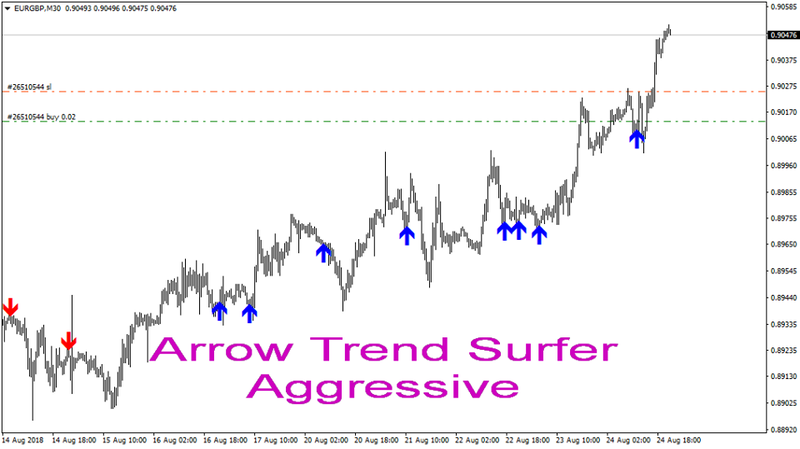 The main job of the Arrow Trend Surfer is to smooth out the price action and eliminate market noise to form a clearer picture of existing trend to give you the best entery point in the market with +95% accuracy. 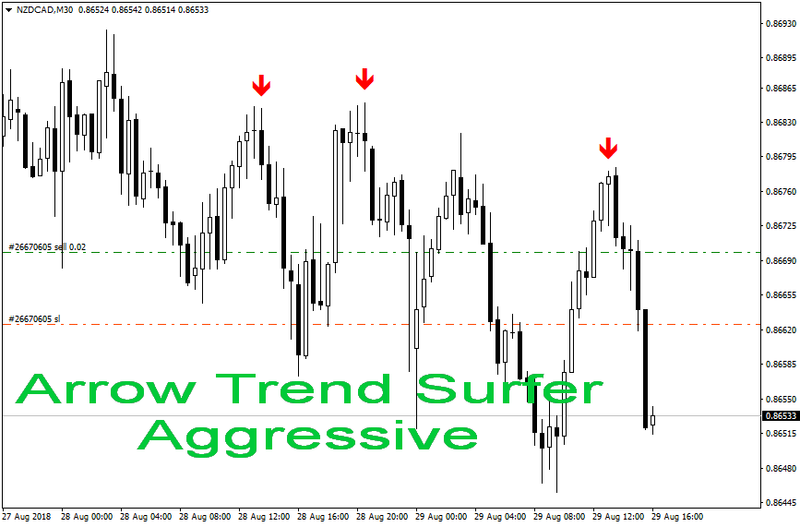 This is where the MT4 & MT5 Arrow Trend Surfer indicator will come in handy by its trading signals, Arrow Trend Surfer can be the only indicator you’ll need. 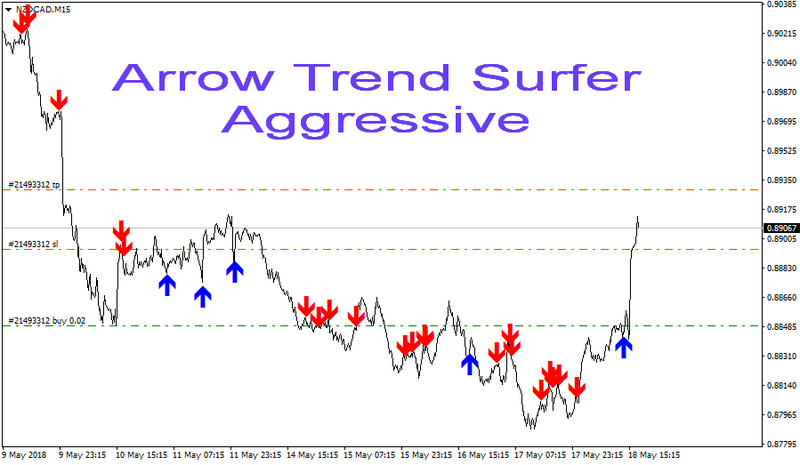 Arrow Trend Surfer will generate trading signals based on already formed trend. The UP and DOWN signals will notify you of each new trading setup as defined in the indicator’s settings. Arrow Trend Surfer signals can be delivered as a small pop up window with a sound alert, email message, or a push notification sent to your mobile device such as phone or tablet. 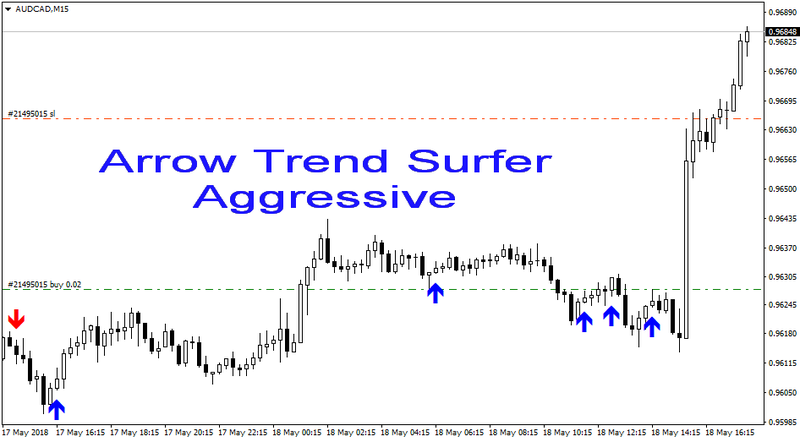 The pop up alerts will notify you of each Arrow Trend Surfer signal – conditions defined by the Arrow Trend Surfer indicator and/or the user. You will no longer need to stay glued to your monitor screen for hours waiting for a favorable setup. ☀ The indicator available on both metatrader 4 and metatrader 5 . ☀ The indicator does not repaint. ☀ The indicator does not recalculate. ☀ The indicator works on any time frame. ☀ The indicator works on any pairs, stock and commodity. ☀ It gives signals immediately when the candle is close. How alerts come to you? Signals can be sent directly to your mobile and email. 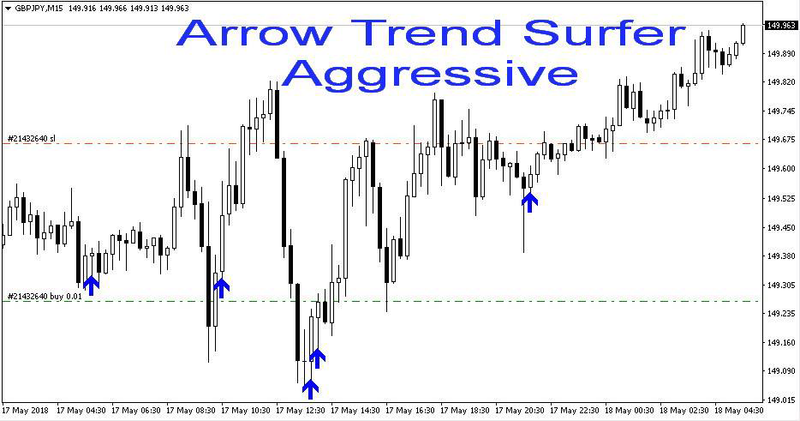 Push notifications to mobile in addition to arrows on the chart and pop ups in MetaTrader our custom MT4 / MT4 Arrow Trend Surfer indicator will also send email alerts and push notifications to your mobile. The email alerts, as well as other notifications can be switched ON or OFF in the indicator settings. The trading signals can also be delivered to your mobile via a push notification. In order for this to work you will need to install the Meta Trader 4 /5 App on your mobile. Push notifications are sent almost instantaneously and because of that they are much faster than email. In order to receive the trading signals to your email address or your phone, your MetaTrader 4 /5 needs to be configured with your server details, email account, phone number, and it needs to be running. 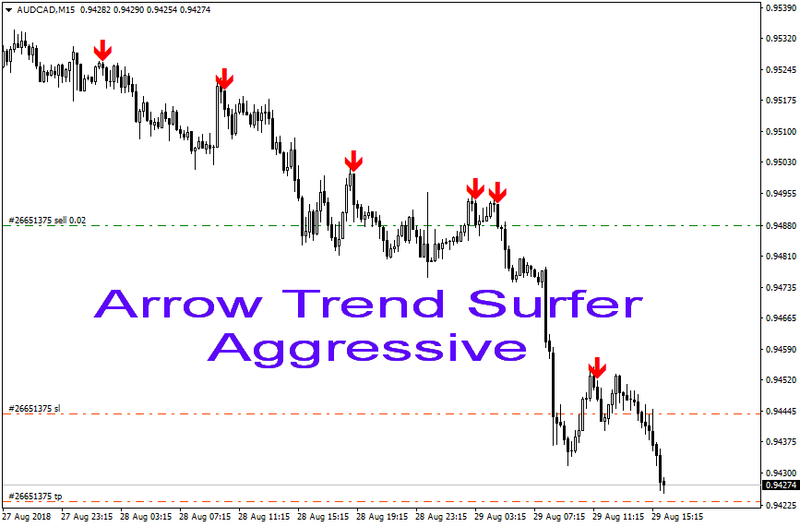 Live trading with Arrow Trend Surfer! Screenshots of the Arrow Trend Surfer signals! 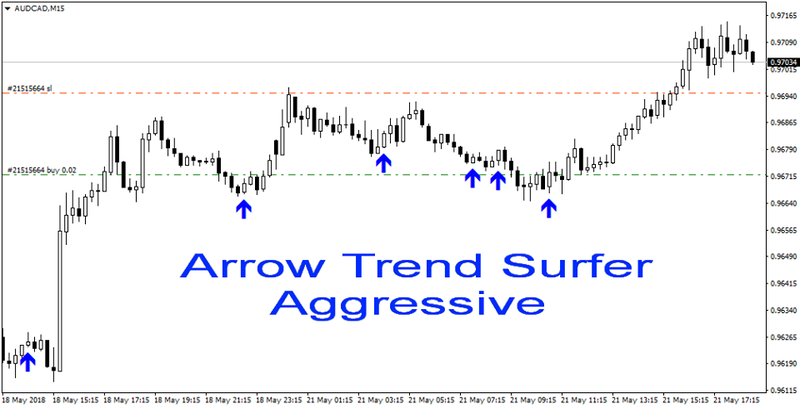 Download Arrow Trend Surfer indicator today. PDF – Explaining how to use the indicator and increase your profit. Checkout process is fully secured by Paypal. You will also receive an email with a confirmation of your purchase. Then you will get your licence of the indicator to your email in less in 12 hour. If you want any other methods to pay then please contact me and i will be happy to help you. ➊. DOES THIS INDICATOR REPAINT AT ALL? No, It is a non-repainting indicator. ➋. CAN IT BE USED ON ANY TIME FRAME? 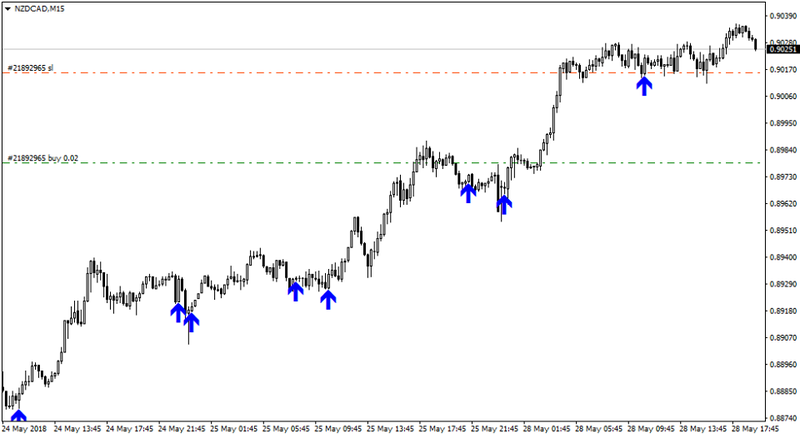 Yes, the Arrow Trend Surfer can be used on any time frame but recommended is M15, M30 and H1. ➌. CAN IT BE USED ON ANY ASSET? 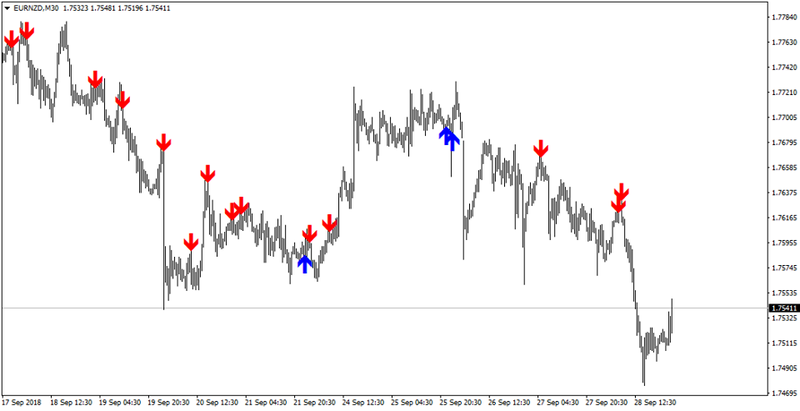 Yes, the Arrow Trend Surfer can be applied to any chart and any asset available in your MetaTrader 4 / 5 account. ➍. WILL THIS TREND INDICATOR SEND SIGNALS? ➎. ARE THERE ANY SUBSCRIPTION OR RECURRING FEES? No, there are no recurring payments. This is a single purchase and the Arrow Trend Surfer will be yours forever without any other additional charges. ➏. HOW CAN I GET NEW UPDATES OF THE ARROW TREND SURFER INDICATOR? All updates or any future improvements are free of charge. Clients will be notified by email. To obtain the updated version of the indicator simply send us your proof of payment and we will send you the latest version of the Arrow Trend Surfer.